Your dryer exhaust and dryer vent system is designed to remove heat, moisture and lint from your laundry as it is being dried. 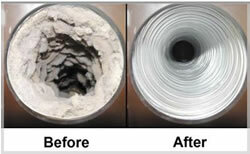 Cleaning the Dryer Vent, improves the safety and efficiency of your dryer over time. As the dryer vent fills with lint and other debris drying time increases, and can cause the dryer itself to clog and overheat.When lint builds up in the dryer vent it prevents air and moisture from escaping the dryer and clothes remain damp. Animal nesting is also another frequent cause of dryer vent blockage. Another problem created by blocked dryer vents, If the dryer is not exhausting properly to the outdoors, carbon monoxide can back up into the home. Preventing accumulation of lint throughout the dryer exhaust system will make your dryer work at its best. Running the dryer more than a 40 minute cycle results in a waste of time, energy, and causes unnecessarily high energy bills. One load of wet clothes placed in a dryer contains about 1/3 gallon of water. Clothes dryers are one of the most expensive appliances to operate in your home, The longer they run, the more money they cost you. In many cases a thorough dryer vent cleaning with Lavender Care is the simple solution to your dryer problems. Al Lavender Care, we will first inspect your system and if needed perform the cleaning task and have your dryer up and running in a safe and efficient manner. We have tools specifically designed to clean dryer vents and with these tools we are able to do a thorough job of cleaning even with the most difficult installations. Dryer takes over 50 minutes to dry a load. Dryer is hot to touch on top. There is a slight burning smell when drying. Humidity inside the dryer door. Excessive lint on dark clothing. If you check the vent outside and you CAN’T noticeably feel the air blowing out at least 12″ from the vent. If you look inside the vent itself and see lots of lint starting to collect inside. Our Lavender Care Dryer Vent Cleaning service technician will come inside and unhook the connection piece that goes between the dryer and the vent. We’ll run the vent cleaning equipment from the dryer side out to the end of the vent. Lavender Care Dryer Duct Cleaning Newest Rotobrush Cleaning System which is inserted into dryer vent, Specialized brushes spin and loosen and simultaneously vacuums all lint, dust and debris to the entire length of the vent. 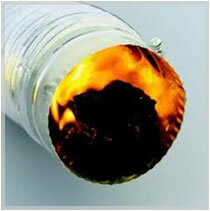 All of our equipment used are the best so we are able to use it without contaminating the environment we work in. Once the cleaning equipment has traveled the length of the vent, to thoroughly clean it, Dryer Vent cleaning of Lavender Care will clean out the connection piece, reattach your dryer and recheck the vent while your dryer is operating. You may also be interested in our Carpet Cleaning Services in Dallas!